S ince the start of the Syrian civil war, the public has consistently opposed U.S. involvement in the conflict. But Americans have offered a somewhat different response when asked how they would respond if there is proof that President Bashar al-Assad’s forces attacked civilians with chemical weapons. Syrian anti-government groups claimed this week that more than 1,000 people died when government forces launched a chemical weapons attack in Damascus. Photos and online video have bolstered their claims. The Syrian government has strongly denied the reports. In two surveys last year, the most recent in December, majorities of Americans said the United States did not have a responsibility to do something about the fighting between government forces and the opposition. 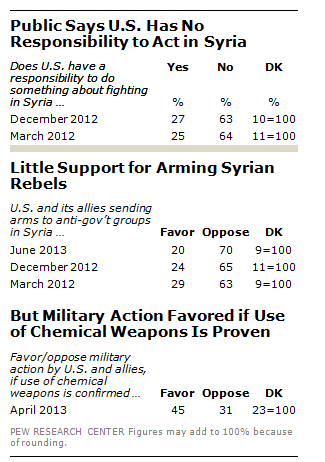 Similarly, in a survey conducted in June, most Americans also opposed arming anti-government rebels in Syria. A Washington Post/ABC News survey last December found an even more dramatic public reaction to the use of chemical weapons in Syria. In general, just 17% thought the “U.S. military should get involved in the situation in Syria,” while 73% said it should not. However, the poll found there would be majority support for U.S. military involvement in several specific instances, including the use of chemical weapons by Syria “against its own people.” In that case, more than twice as many supported (63%) than opposed (30%) the United States becoming involved militarily.